Somewhere, I don’t remember where, while wandering about in my writing community, someone recommended Uni the Unicorn by Amy Krouse Rosenthal, Illustrated by Brigette Barrager. This is a children’s book for ages 3 – 7 years. My local library system has five copies all of which are currently checked out. Following is the publisher’s description of the story. The story is lovely, but ends shockingly. SPOILER ALERT! Uni and the little girl do not meet. My reaction was, “What the heck!” The ending was not what I expected. 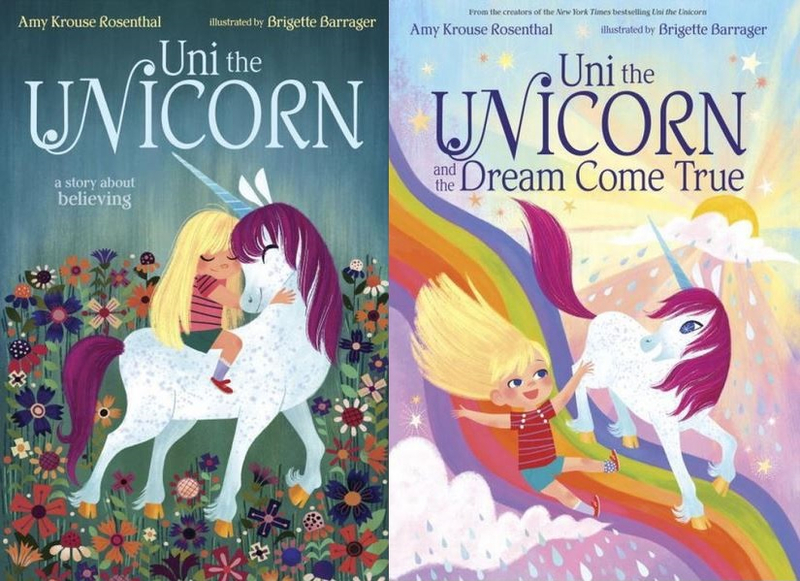 Scheduled for release on September 5, 2017, is Uni the Unicorn and the Dream Come True by Amy Krouse Rosenthal, Illustrated by Brigette Barrager. I hope Uni and the little girl meet this time. I requested my local library system add the book to their collection. Recently, when I checked the status of my request, I found that, on by behest, they had ordered five copies. Rosenthal inspired within me the desire to write my own children’s book influenced by the story-world in my current work-in-progress. My mind minions are already providing me ideas for the story and the lesson it will teach. On March 13, 2017, Amy Krouse Rosenthal passed away. Rosenthal wrote more than 30 books. I, for one, had been touched by her writing. She will be missed.